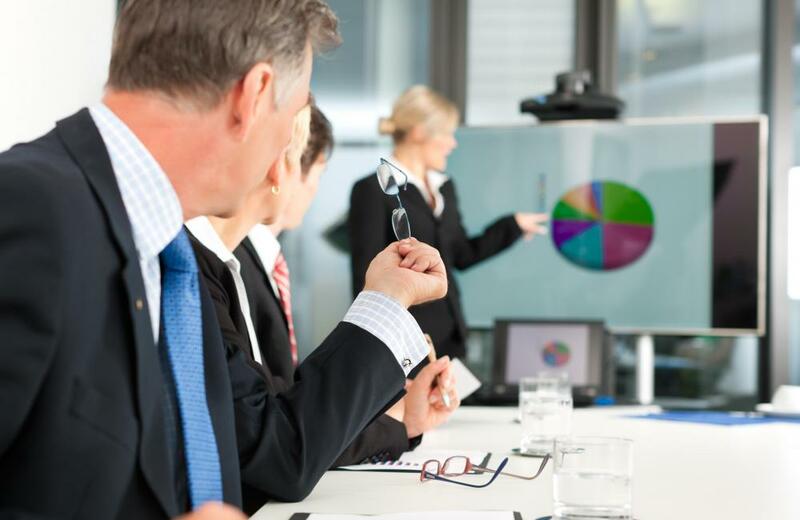 What is Business Presentation Software? Pie charts may be featured during a business presentation. 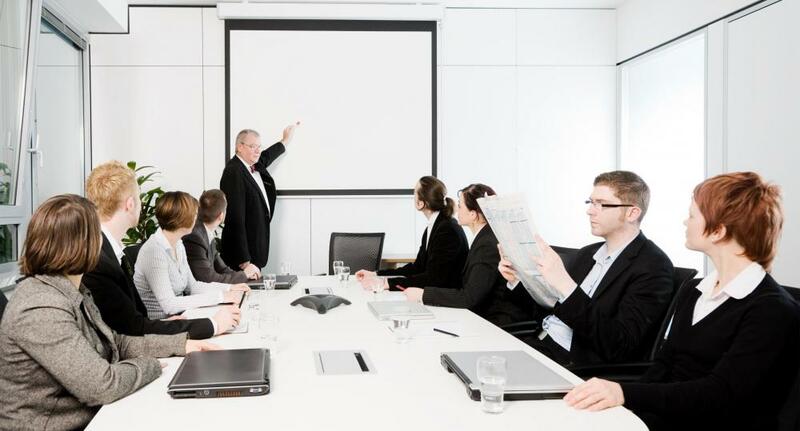 Slideshows may be given during a business presentation. 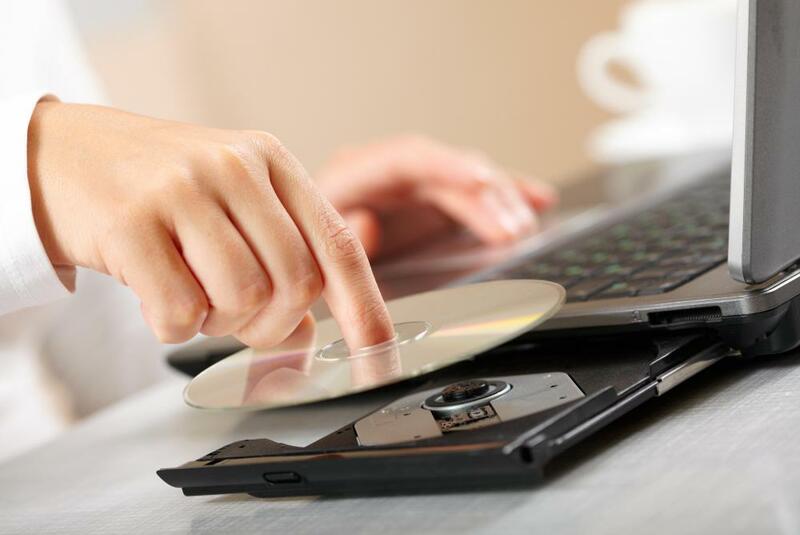 Business presentation software often includes CD-ROM discs. A common business presentation software is PowerPoint, a slideshow software created by Microsoft. Business presentation software includes any software application that allows a user to create or display a business presentation. This is generally used in boardrooms or assemblies and can include a wide variety of software applications. One or more may be used at any given presentation. One of the most common types of business presentation software is the slide show presentation. Many basic editions of this type of software are found standard on most computers and allows users to add pictures, text and sound to demonstrate a point. Photos and graphics may include things like pie charts and survey results taken prior to the presentation. Other business presentation software programs allow users to create everything in one place. This would include slide shows, graphics, charts, and interactive media like videos and CD-ROM discs. It is often also possible to create extra materials including print-outs and training materials. The benefits of using specialized business presentation software in comparison with creating a presentation from scratch primarily have to do with the appearance of the finished product and the ease with which it can be done. Finding or making graphics oneself and inserting them into a slide show or printout can be tricky, and if done incorrectly, comical. Additionally, it is very easy to leave out slides, add too many slides, or get slides mixed up so that they appear at the wrong time. Business presentation software virtually eliminates these risks. In most cases, business presentation software also features more impressive graphics, templates, and charts than those that could be created from scratch by the average employee. This allows business professionals to offer more effective presentations with compelling visuals and text; a point that is especially important when it is being made to potential clients or buyers of a good or service. Businesses of all sizes can benefit from the use of business presentation software and likewise, there are a myriad of program options with equally varied price tags. Basic slide show software can be downloaded from shareware sites free of charge, but is limited to the graphics and photos the presentation creator has on hand. This may not pose a problem for smaller businesses or very simple presentations. Business presentation software that includes graphics, photos, templates, and other flashier items can run from a few hundred to a few thousand US Dollars depending on the maker of the software and the potential uses for it. These pricier options generally prove to be a wise investment for companies with more money riding on an effective presentation. Before putting down the money for one of these programs, it is a good idea to shop around, get referrals from colleagues, and read customer reviews for each program. How Do I Choose the Best Service Business Software? What are the Different Types of Business Software? What Should I Expect at a Free Business Presentation? How do I Choose the Best Professional Graphics Software? What is a Business Presentation? What is a Business Plan Presentation?